The city of Jerusalem has a wealth of sites and spectacular places packed with history and interest. However, at the same time the city has a history full of conflict, functional problems, context and intricate ethnic relationships.The route of the Turkish train’s railway lines in the city of Jerusalem’s boundaries is one of the places where these complexities are most apparent. The history of the railway tracks leading to Jerusalem began towards the end of the 19th century. The railway station was situated in the Old City’s outskirts, while the newer neighbourhoods outside the city’s wall started to evolve. The neighbourhoods on the sides of the route are comprised of different ethnic populations, some of which are closed societies. The German Colony, Greek Colony, Arab Baka, Jewish Talpiot, the Arab village of Bet Safafa and later on the Katamon neighbourhoods. After 1967 the area increased as borders were removed and Jerusalem spread to additional areas; however the disconnection across the railway lines continued to be apparent also after the train ceased regular activity along the lines. The Train Station, the heart of the city of Jerusalem became abandoned and neglected. In the beginning of 2000 the Jerusalem City Development Authorities drew up a master plan for the development of the Emek Refaim area. 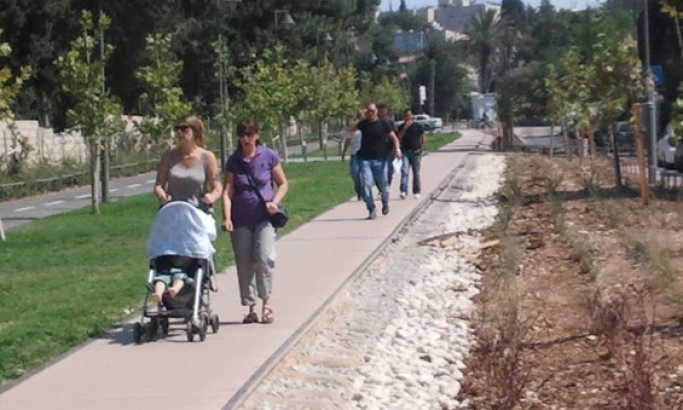 Already during the project’s initial stages, when searching for the border of the Emek Refaim Park it became clear to us that the branch of the train lines leading to the Han Station must be an integral part of the park. The guiding principle was to create a harmonious sequence of pedestrian promenades, bicycle lines, and a linear park creating an interlock between the neighbourhoods on both sides. Homogeneity was important for the creation of a common denominator between the neighbourhoods and landscapes which are so different from each other. The type of connection and its social and cultural repercussions were discussed at length together with representatives of the public and organised by the Jerusalem Development Authorities (JDA). The Railway Park has therefore become a unifying force and common ground both for developing equal rights to public areas of leisure, relaxation and a base for dialog between the different neighbouring groups. The main elements on the route were the remaining lines which were considerably well preserved, this included the iron tracks. The decision was to use the tracks as the main pedestrian pathway throughout the park, and to do so, the space between both sides of the track have been covered in coloured architectural concrete with wooden overlays on the mouldings. To date, the first two sections of the park have been completed. The north east side where the third section going through Bet Sefafa village, Talpiot Industrial Area, Makor Chaim and Gonen are currently being implemented. The fourth section of the project leading to the Refaim River Park will be finished within a year and a half, completing the route to a full 5.5 km. 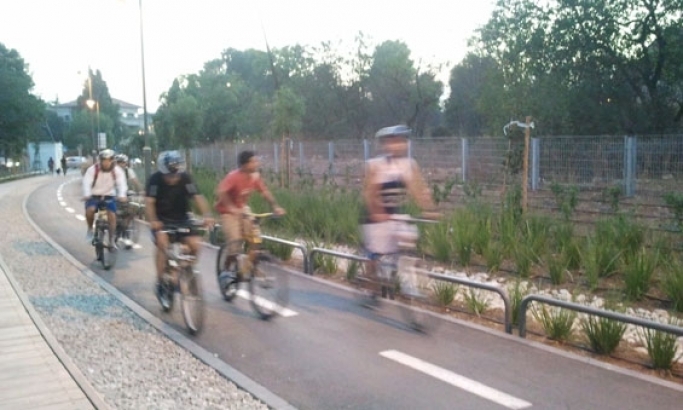 The project was designed by Tichnun-Nof Ltd Landscape Architects from Israel led by Yair Avigdor and Shlomi Zeevy. The planning team included Raz Matalon, Hagit Bergman, David Eran and Roman Katz.